I just have a question about how Pinside values the various pinball machines. I noticed that all 3 of the pinball machines I've purchased have had a fixed value for over a year here on Pinside, never fluctuating despite there being lots of market activity on each one of them. Do the values get updated as more machines process through the market, or are they pretty much just set and never change? I know these values are merely guides, but since they're there I'm curious how they work. Thanks for any insight! Dont take them to seriously as alot can determine price of a pin .... i find pinside prices to b on the high side compared to real world prices. I think that Robin is the only one that can really answer how often and to what degree those values change. I also think that you are holding on to those values a bit strongly. They really don't mean a damn thing. The prices appearing on the game's profile are based on ads for games that get marked as sold in the marketplace. It would be nice if the algorithm was made public, though. I'd love to see an interactive website like KBB somewhere with fields for certain mods that are tied to the sale price, so you can really see what a certain mod does to the resale price of a pin. You know, similar to how most home improvements don't add the full value of their cost to the house. So for example, I see people routinely discount the full $400 for a ColorDMD if you want it removed and replaced with the old DMD. On the other hand I personally subtract about $300 if I see a machine with an LED "Skittles treatment" since I'll have to replace most if not all of the LEDs since I only use white for GI. What does having a CPR playfield do to the price on average? Then you could theoretically plug in your machine and the mods you had and get a fair estimate of value. My wife tells me they are all worthless. It's just an estimated value/range to use as a starting point. LEDs are a personal preference. Depending on the game, sometimes a CPR playfield bumps up the value, sometimes not. Some games have a price ceiling, regardless of condition. Better than her telling you you're worthless, eh? Probably, but we'd have a better idea with data, right? I think the same could be said - personal preference - about most home upgrades. Curious though, what CPR playfield hasn't bumped the price on a machine? My assumption is that a CPR replaces a worn playfield, though I imagine someone must have replaced a relatively pristine playfield with a CPR. Even that seems like it would increase the value because of the new clear. It would be nice if the algorithm was made public, though. I'd love to see an interactive website like KBB somewhere with fields for certain mods that are tied to the sale price, so you can really see what a certain mod does to the resale price of a pin. You know, similar to how most home improvements don't add the full value of their cost to the house. So for example, I see people routinely discount the full $400 for a ColorDMD if you want it removed and replaced with the old DMD. On the other hand I personally subtract about $300 if I see a machine with an LED "Skittles treatment" since I'll have to replace most if not all of the LEDs since I only use white for GI. What does having a CPR playfield do to the price on average? I like the concept, but I doubt there are enough pinball machines being sold to make that analysis (I was admittedly a history major and have very poor math skills, so I'd be happy to be proven wrong on this!). 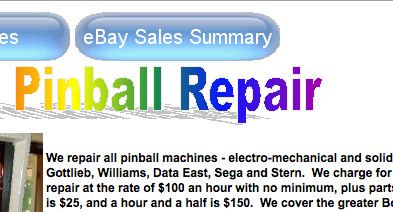 Any machine that sells will have variables like other mods installed and condition of the playfield, boards, and cab, that make it hard to pick out what affect an individual mod has on the sale price. If enough of each title were selling each year you could use statistical analysis to make a meaningful assessment about the market value of individual mods. As is done with existing homes, which have the same problem of many variables, but have the benefit of millions of sales per year providing lots of data to work with. But given the tiny size of the pinball marketplace, I think we're mostly stuck with gut-feeling assessments based on anecdotal evidence. ColorDMD seems like a unique case, since you can move it game to game and it seems to be universally respected. So even with limited data I'd feel pretty safe saying ColorDMD keeps 80%+ of its value on resale. Much harder to say with other mods. Putting in a brand new $800 playfield does not automatically increase the value of the game by $800. Is this calculated from all sales or is there a look back period? As pinside gets older and there is more sales data it's neat to see that a pin sold for $500 10 years ago but it's not that helpful in determining current value. A nice feature would be the ability to set a begin date like 1 year or 18 months back and get values based on that date range. If the values on the game pages are calculated periodically and stored in a database this could be tough but if they are calculated on the fly when the page loads it doesn't seem like that tough of a filter to write. Oh, I see what you're saying. I think we agree - a CPR playfield increases the value over a roached playfield, but generally doesn't capture the cost of even installing it since a playfield swap is so time consuming. I can't even find an original joker poker that cheap these days! Exactly. It usually ends up being a labor of love rather than a monetary increase in value. However, for high-value popular titles, a proper high-end restore to like-new condition (such as a HEP restoration) can drastically increase the value well over the price of a nice original, simply because it costs so much to actually do that begin with. You'll have to ask Robin about specifics. How about adding a total to the collection page so you can see how much your entire collection is worth based upon Pinside averages. Would be great to know how pinside calculates market values from sales. I always assumed it's just an average, so a major project up to a HEP restore get lumped together. Pinside is my guide to supposedly accurate pricing; as i'm sure it is for most people. Do people actually use the Pinside-supplied value for games much? I guess I did when I first started using the site, but now I just search for old sales to see what people are asking (and paying). Do people actually use the Pinside-supplied value for games much? Pinside likely has the most "trusted" values. And, yes I frequently look at sales history to view both the price and condition to gauge value. I have not bought a Mr. Pinball book in a couple years because they seem on the lower side of value. Plus Mr. pinball clasified don't seem to be the go-to place for sales anymore. Ebay might be a good reference if you search for "Sold" listings and not the crazy high "free business advertising" listings. Craigslist has been my most successful buying/sales outlet; maybe 60/40 with pinside. But there is no way to track the listed price and sold price. Just look at the Boston Pinball Repair site. It's updated every 3 months or so and is a good starting point for historical sold listings. You can go a step further and average that data with the Pinside data to get an even better picture.